EASY GLIDE storage drawers open from either side of the island. The kitchen is the heart of every home. Make yours the ideal spot for family and friends to gather with our exceptional Olivia Island. 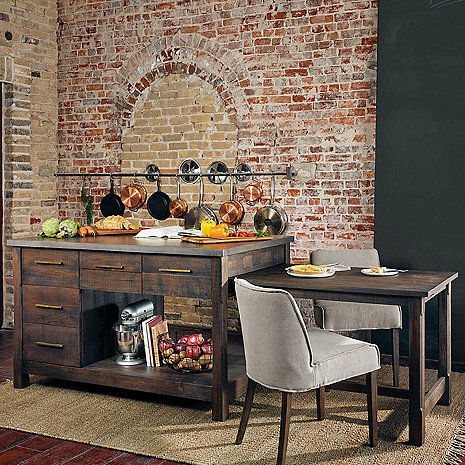 Expertly crafted with attention to every detail, this piece features ample storage drawers accented with rustic hardware that pull out from either side of the island, a large lower shelf for storing over-sized items and a sturdy tabletop that easily slides out for seating or stows for extra space. The prep top is made from a food safe concrete mix set upon an impressive imported rubbed black acacia wood island. What is the length when it is fully extended? BEST ANSWER: The Olivia Kitchen Island is 111.65 inches when it is fully extended with the tabletop fully extended. Want the item but don't want to pay the current price? Make Wine Enthusiast an offer and see if you can score a deal! Fill out the form above with your suggested offer. Your offer request will be immediately forwarded to, and reviewed by a Wine Enthusiast Sales Consultant. If your offer is accepted, a Wine Enthusiast Sales Consultant will contact you within 24-48 hours to complete your order.